The Yorkshire Terrier, or "Yorkie," is a dainty, lively, affectionate, happy, energetic, confident and devoted dog. He focuses completely on his family, and craves attention, love and togetherness. He wants to be near you and will sit and cuddle in your lap--but only for so long! He loves and seeks out adventure, and can get into mischief if he isn't given enough to do. He is not a dog who can be left alone in a yard; he needs human companionship. He is a very high-energy dog who requires only moderate exercise because of his size, yet still needs to romp and play around the house, and chances to run free in the yard. He loves to travel, and he likes long, daily walks. He plays hard and seems to have a boundless capacity for fun. When outdoors, he should always be leashed or in a safely enclosed area, because he will chase after small animals. He is also fearless and assertive and will confront much larger dogs. He can get along with dogs and possibly with cats if he is brought up with him, but he will hunt and can harm smaller, rodent pets. He gets along well with older, responsible children, but does not have the patience for younger, smaller ones. He is a fragile dog who if handled too roughly will snap at them. He mustn't be tossed, or allowed to jump from high places. He is a friendly dog who likes people, although he can be timid with visitors if he isn't introduced to them while still a puppy. An outstanding watchdog, he is intensely protective, guarding his territory fearlessly with his acute hearing and his relentless, high-pitched bark. He can be annoyingly barky and yappy, and must be trained to stop yapping on command. He is easily trained, eager to please you and can remember many different commands. He excels at dog sports, especially agility. He can however be stubborn and willful if he doesn't get his way, and needs to be trained with a great deal of patience and praise. He is difficult to housebreak. He practically doesn't shed so he would make a good pet if you are a clean-freak. The Yorkshire Terrier is 8 to 9 inches tall (to shoulders) and weighs 4 to 7 pounds. He has a long, straight coat. His coat color can be black and gold, black and tan, blue and gold or blue and tan. Pet coat: His coat only needs to be brushed occasionally, and is clipped short every few months. Show coat: Brushed for 10 to 15 minutes daily to prevent mats and tangles, and trimmed every 6 weeks. The Yorkshire Terrier is named for the city in England where he was for many years the pet of working-class people. He was used by miners to hunt rats in the mines, and by weavers to hunt them in clothing mills. By the Victorian era however he had become popular with the upper classes, and made his appearance at his first show in 1861. 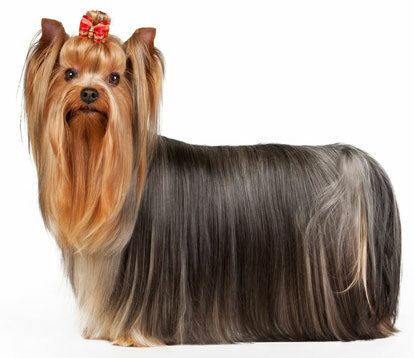 He became officially known as the Yorkshire Terrier in 1870, and was admitted to the AKC in 1885. His popularity dipped during the 1940's, but he has risen since to become the world's most popular terrier breed. His AKC popularity was 2nd out of 157 breeds in 2007.